Crossrail trains will not start running through central London this December as planned. When open, it will add 10% to Central London’s rail capacity, and will boost the capital’s economy by around £42 billion. In a statement, Crossrail Ltd said it has been working hard to maintain the programme and sufficient testing time is required to introduce the next phase of the railway – the central section between Paddington and Abbey Wood – in a way that can be guaranteed to be safe and reliable. It said that the original programme for testing has been compressed by more time being needed by contractors to complete fit-out activity in the central tunnels and the development of railway systems software. Testing has started but further time is required to complete the full range of integrated tests. Phase One, the introduction of Class 345s between London Liverpool Street and Shenfield was delivered around a month late in June 2017, while Phase Two, the introduction of ‘345s’ between London Paddington and Heathrow Airport has also been delayed due to issues with European Train Control System (ETCS). For the FULL story, read RAIL 861, published on September 12, and available digitally on Android, iPad and Kindle on September 8. 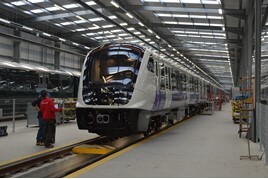 At least the stations that are currently getting the upgrade will still be completed by the Elizabeth Line starts operating in phases including Abbey Wood-Heathrow & Reading and Shenfield-Heathrow & Reading plus with addictional services including Liverpool St-Gidea Park which could extend to Shenfield. And more Class 345s being delivered from Bombardier Derby and some have already entered service. Some of TfL Rail’s stations in East London that are still being upgrading may not be completed until after Christmas or next year. Such as Gidea Park, Goodmayes, Seven Kings, Ilford, Manor Park, Forest Gate and Maryland. Whilst Chadwell Heath station and Brentwood station in Brentwood Essex have already been upgraded. Plus Hanwell and Acton Main Line stations in West London that are also currently being upgraded with new step free accessibility might not be finished in time this year and are scheduled to be completed next year. Whilst Romford station could have ramps being replaced by lifts to access all 5 platforms (platforms 2-5) including platform 1 (which is used for London Overground Romford-Upminster shuttle service). The real issue of this announcement was the way it was sneaked in a bank holiday week when Parliament was not sitting which suggests its Government at fault and not London's Mayor or TFL with buck stopping at Chris Grayling and the DFT ! Anyone who uses Crossrail Stations now as TFL or future Underground Stations can see that work is still not completed on even non Crossrail parts of these stations with Whitechapel Station well behind schedule. By coincidence this announcement was made when the Victoria Line celebrated its 50th birthday with the opening of its first stage from Walthamstow Central to Highbury and Islington. Perhaps Crossrail could look at following the example of Victoria Line with its central section which is independent of other lines opening in stages e.g Abbeywood to Canary Wharf then progressively westwards as sections and Stations are completed. This would help overcome the major problems TFL Has of lost fare revenues caused by this delay while I assume bus service changes will have to wait until Line opens in 2019. The reality is London's still done well in building a brand new railway and thus blip is more to do with politics especially announcement of opening dates far to early on a major construction project.